I have had excellent results with the hair repair duo and am now alternating that with the density shampoo and thickening mask. I seem, somehow, to currently have twice as much hair and much softer. People keep asking me if I have had extensions or lost weight or commenting that I am looking well - even when not specifically mentioning the hair, they can see something is different! This is an expensive product but now an essential investment for me. I've used the shampoo twice and can honestly say that my hair feels and looks much fuller. really happy with this product and will be purchasing again! thanks Grow Gorgeous! The asking price for this shampoo may seem a bit steep at first glance but if you've reached that point where conventional shampoo is leaving your hair dull and lifeless then you simply wont regret this purchase. At the time of writing this review, I've used this shampoo for the first time yesterday and already my hair feels and looks better than it did before. I had quite low expectations but even my scalp feels much better after the cheaper brands were beginning to irritate it. Hair does look fuller with a healthy sheen and I'm not tempted to try out the other products on this website. Get ready for some greasy hair! So, so disappointed! After reading several reviews online, I thought this may be ''the one''. Unfortunately, every time I wash my hair with it, it makes it sooo greasy, it makes my hair look really dirty, as if I hadn't washed it for weeks. I tried it several times, thought maybe I had to keep going to see some progress but no, the outcome is exactly the same every time: very, very greasy hair, whether left natural, blow dried at home or straightened after drying it. It is an expensive shampoo which, for me, did not do what it says on the tin... I would NOT recommend it. I have long brown hair, not treated in any way. Such a shame as I had high hopes from the online reviews. I tried it again yesterday evening, and I once again need to wash my hair - this time with a different branded shampoo. 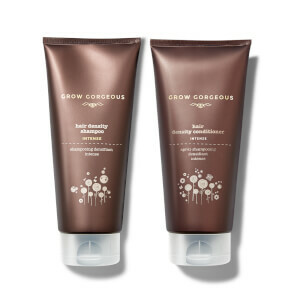 This Grow Gorgeous shampoo will be going straight to the bin, an expensive mistake! I've been using this for a few months now and I definitely won't go back to using normal shampoo! Takes a while to get the amount right as I find too much makes my hair a bit greasy but once you get the portion control right, there's no looking back! This shampoo so thick compared to other shampoo. It leaves your hair feeling really amazing. I use the shampoo and conditioner for blonde hair followed by split end repair. I find the three together make my hair feel really special.